The What: Improving on the Access ceiling-recessed projection screens, Draper's new Access Fit features a much smaller case cross section for above ceiling motorized screen applications. The What Else: Access Fit is ideal for small to medium size boardroom, classroom or training room integration, offering the same quality components engineered into a smaller profile to fit into tight spaces above the ceiling. Draper has also re-engineered the Access bottom closure panel to make it easier to attach and improve the panel's overall engagement with the screen housing. 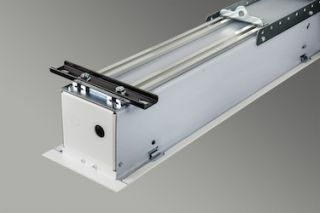 An improved "T" bracket engagement allows panel to hinge downward for service, eliminating the need to make extra trips up and down the ladder carrying the closure.